The state located along the Atlantic coast had as Native Indians the Lenape Tribes. They were also known as the Delaware Indians. Their first encounter with Europeans were with the Dutch in the early 17th century. Both were interested in fur trade. The region was part of the New Netherland colony held by the Dutch. During the 1600s another area was settled as New Sweden by Peter Minuit. When the English took control of New Amsterdam in 1664, they acquired the region of New Jersey to the south as well. 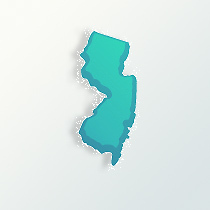 It was named the Province of New Jersey. Major ethnic and religious diversity has been a part of New Jersey genealogy. The earliest arrivals were the Dutch Reformed migrants, then New England Congregationalists and Scots Presbyterians who owned small farms. With the English Quakers and Anglicans, larger farms were established away from the shoreline. Many of the early settlers had actually lived in other colonies in America before resettling in New Jersey. On December 18, 1787, New Jersey became the third state to ratify the new U. S. Constitution. By February 15, 1804, New Jersey became the last northern state to abolish any new slaves coming into the state and new laws to phase out existing slavery. During the American Civil War, some 80,000 soldiers came from New Jersey as it sided with the Union. By 1865, about a dozen African-Americans in New Jersey were still apprenticed freemen, with none being slaves. During the 1800s, New Jersey went from agriculture based to a more industrialized economy, one based on manufactured commodities such as textiles, especially silk. A leading industry during the middle to late 19th century was iron mining. The population of New Jersey was about 184,000 in 1790 and then 373,000 by 1840. When looking at New Jersey genealogy, the increase was due to the influx of people from other states to work the new industrial jobs in the state. By the late 1800s new waves of foreign-born immigrates arrived and settled in New Jersey. A large Italian community was established in the counties of Passaic, Bergen, Union, Hudson, Morris, Somerset, Middlesex, Mercer, Monmouth, Ocean, Atlantic and Cumberland. The Irish lived in Sussex, Burlington, Camden, Gloucester and Cape May counties. Several with German ancestry and from the German Pennsylvania regions lived in Warren, Hunterdon and Salem counties. During the 20th century, other diverse ethnic groups came to live in New Jersey. It has the second high Jewish population, next to New York. Also, the second highest Muslim population in the country. Many natives of the nation of Costa Rica have come to live permanently in New Jersey as have the refugees who left Cuba. Those of Hispanic back group live mostly in the northern end of New Jersey. The state has a high percentage of Koreans, Chinese, Filipinos and East Indians. The Asian population is mostly in the center of New Jersey. Overall, those with Italian ancestry represents 18 percent of the state’s population, the largest ethnic group and located all over the state. The African-American population which grew from those who left the southern states in the late 19th century for new opportunities in New Jersey, now represent 15 percent. The total population, when looking at New Jersey genealogy, has increased from 4 million in 1930 to 8.7 million in 2009, showing the tremendous growth.